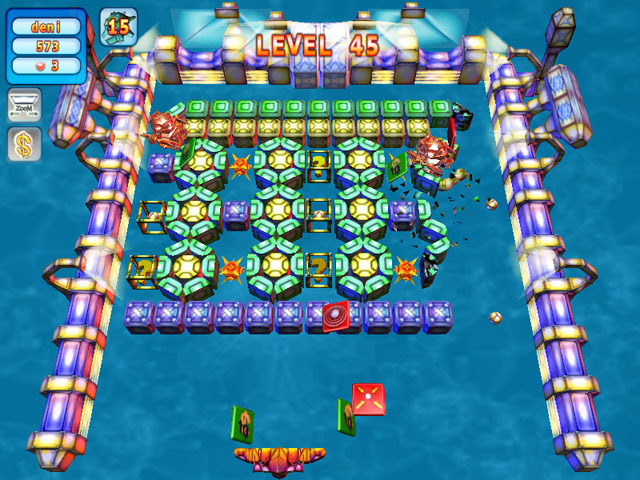 Check out our new block-smashing game with a twist!Tons of power-ups and dynamic game play make Action Ball a must for arkanoid fans!Smash bricks and fight with robots that are trying to protect levels from intense destruction.A supply of special weapons and bonuses not seen in other Breakout games are on hand to turn the tide of battle in your favor, however, including a dazzling multi-missile attack that destroys every robot on the screen. ...... every block. A supply of special weapons and bonuses not seen in other Breakout games are on hand to turn the tide of battle in your favor, however, including a dazzling multi-missile attack that destroys every robot on the screen. Rounding out this outstanding package are superb 3D graphics and sound effects that beg to be played loud. Classic 'Hop and Dodge' action is reborn in this exciting arcade game. Qweas is providing links to Action Ball Deluxe 1.1 as a courtesy, and makes no representations regarding Action Ball Deluxe or any other applications or any information related thereto. Any questions, complaints or claims regarding this application Action Ball Deluxe 1.1 must be directed to the appropriate software vendor. You may click the publisher link of Action Ball Deluxe on the top of this page to get more details about the vendor.